Fashion Week is not an occasion when future collections are previewed and designers get to position themselves as market leaders, it’s also our first glimpse at future trends in the industry — for clothing and sneakers alike. Labels look to re-establish themselves as leaders, while making enough waves with their footwear to influence future movements. As fashion houses debut new in-house footwear collections, brands such as Nike, adidas, and Reebok strategically partner with high-end labels introduce new silhouettes, tease upcoming collaborations, and connect themselves with a world beyond sportswear. During the Fall/Winter 2019 fashion weeks, a number of high-profile collaborations and exciting in-house designs graced the runways of London and Paris. To analyze those looks, we’ve enlisted five leading industry experts who were on the ground to share their thoughts on what they saw, their favorite sneakers, and what to expect as we move toward FW19. Scroll on to read the views of Solebox’s Aljoscha Kondratiew, KM20’s Olga Karput, Drake’s image director Mellany Sanchez, Caliroots’ Sebastian Hellström, and The Store’s Celia Solf. What footwear trends if any jumped out at you during the FW19 fashion weeks? Aljoscha Kondratiew (general manager, Solebox): I think the chunky dad shoe trend is slowly fading out and being replaced by new looks. On the one side, I see a return of the classics. For many, they never left, and for me, they came back in a new look. An example would be styles like the adidas SC Premiere, which was spotted on the feet of Jonah Hill. On the other hand, I saw more innovative product interpreted in a futuristic way, such as the Nike Air Max 720 in collaboration with UNDERCOVER. Sebastian Hellström (head of buying, Caliroots): We’ve been seeing a lot of trail shoes and mountain and hiking boots for a few seasons now, but it’s going to be even bigger in Fall/Winter 2019. Of course, Solomon is killing it in this arena, but just about every sneaker brand is offering up their version of the trail runner, and brands like Acne and Diemme are showing great trail boots. Celia Solf (creative consultant, The Store): We definitely saw more of the running and hiking direction from brands that are popular in cities like Berlin. As sportswear is a big thing and nightlife also plays a big role, those types of shoes work very well here. I liked seeing boots with big rubber soles, kind of hiking style but also for indoors and even warm temperatures with shorts and knee socks. Olga Karput (founder, KM20): Well, hybrids are trending. It’s fascinating to see how Matthew Williams transforms sneakers into boots. Vetements took their sock runner to the next level and removed the sole from them. Be it sneakers or not, collaborations are still on the rise. Check ASICS x Kiko Kostadinov, Heron Preston x UGG, and Raf Simons x Dr. Martens. Would you say there was a shift away from sneakers and more toward formal footwear at the FW19 shows? Kondratiew: I recognized a lot more boots than in past seasons. Sneakers are definitely out there, but casual footwear was more visible than in recent seasons. I would say a lot of people who hopped on the bandwagon and wore sneakers during the last seasons because of general hype just reverted to their usual style. Hellström: We’re definitely seeing some more formal footwear, but with an unexpected twist. 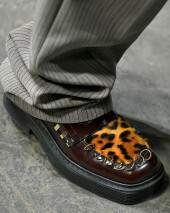 The Marni loafers, which featured furry animal prints, tassels, and piercings, were fantastic. Eytys also offered an unexpected take on this trend. But sneakers are still going strong. I think it’s fun that the consumer has a wider range of footwear to choose from — it doesn’t have to be just one thing. Solf: No, not at all. Almost every brand had a strong sneaker or collab with a sneaker brand. Karput: No, I wouldn’t. There is no substitute for sneakers, both on the runways and on the street. Was there a sneaker or collab on the runway that was an absolute must-have for you? Mellany Sanchez: At the COMME des GARÇONS HOMME Plus show, the posture and stomp of the models really gave way to an attitude and a style that made me love their Air Jordan 1 collaboration. Layers of mesh, wool, and velvet harnessed by rubber and metal grip-locks almost created systems for styling that provide a unique environment for the shoe. It reminded me of how important new styling measures are to appreciating beloved silhouettes that we think we already know everything about. Kondratiew: The sacai x Nike LDV Waffle Daybreak is a must-cop. Hellström: ASICS x Kiko Kostadinov. And once again Nike x UNDERCOVER was beautiful. Solf: Both the GmbH and AFFIX ASICS collaborations. Karput: The ASICS x GmbH collaboration is a must-have for FW19. Three colorways perfect for girls and boys. 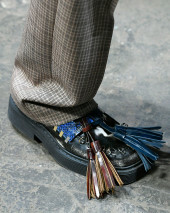 With the dust settling after fashion week, which footwear brands are exciting you most at the moment? Kondratiew: I think Nike got a lot of coverage through UNDERCOVER and sacai, ASICS x GmbH was interesting, and adidas showed smart collaborations and authentic stories in their Statement/Consortium showroom. I’m still curious what the deal is with these BAPE STAs x OFF-WHITE. Hellström: Salomon and ROA are both coming with really strong FW19 collections, which lean in hard on the trail trend. Solf: The coolest shoe I have seen in a long time was the ALYX Chelsea boot with the removable Vibram sole for men and woman. Just amazing! For sneakers, Nike and ASICS always. Karput: It feels like Nike is leading right now. It’s ahead of other footwear brands in terms of exclusive collabs and classic releases. Everybody is excited for what’s next. Finally, tell us the shoes you packed to wear at fashion week this season. 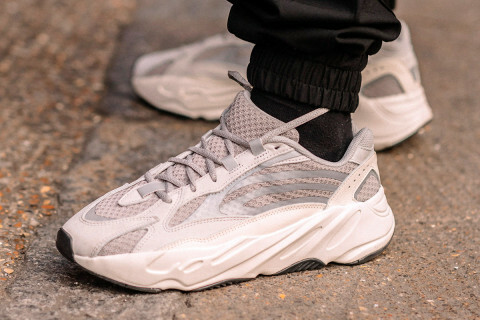 Kondratiew: I packed light this time: a pair of A-COLD-WALL* x Nike Zoom Vomero +5 — without the heel bag — and a pair of YEEZY 700 V2s. Hellström: Too many: OFF-WHITE x Jordan 1, Kiko Kostadinov x ASICS GEL-Delva 1, Salomon Lab XT 6, adidas Continental 80, Converse Chucks 70s, and Dr. Martens loafers. I told you — too many! Solf: Nike Air Force 1s in white as a classic for every trip, Calvin Klein 2015W39NYC Western Claire leather ankle boots, and the ASICS x Kiko Kostadinov that launched during that trip, too. Finishing off the rotation was the very cool black worker boot from Stefano Pilati’s own brand Random Identities, which just launched a few months ago. Karput: I packed Nike x A-COLD-WALL* Zoom Vomero +5 and Martine Rose x NikeLab, both in white. I also wore 1017 ALYX 9SM crystal-embellished thigh-high boots and YEEZY heeled boots in black. All the essentials for the season.